Bridgeport VMC 500 CNC Vertical machining centre 500 x 350 Hiedenhiem control and CAD_CAM link. Tryax Vertical CNC machining centre 600 x 400 with Centroid Control and CAD_CAM link. 4 Station tool changer , threads, helix’s, reverse tapers, etc. 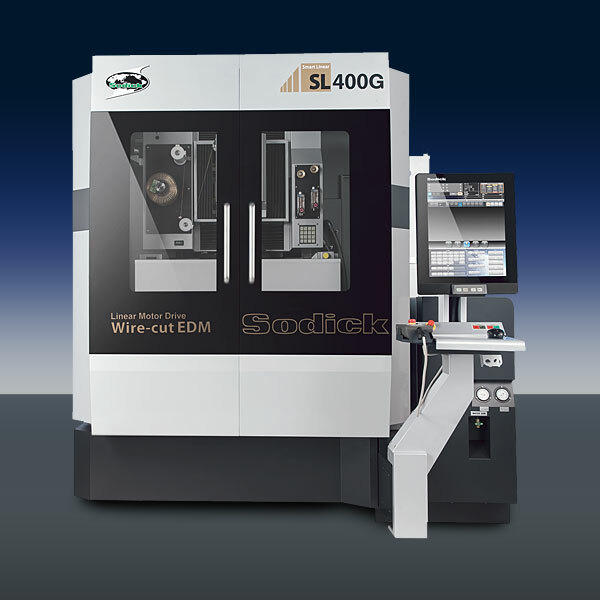 Fine Sodick AM35R 4 Axis Full CNC Spark Eroder ,4 Station tool changer capable of superfine finishes of 1uR max. threads, helix’s, reverse tapers, etc. Fine Sodick K1C Small hole EDM drilling machine 0.3mm to 3mm Dia. Colchester Triumph 2000 Short Bed Gap Lathe with Hepworth Hydraulic Copy Turning. Jones & Shipman Cylindrical Universal Toolroom Grinder 254 x 609 Exterior 203 x 254 Interior Equipped with Wheel Forming Facilities. Design Facilities including Solid Works, Rhino 3d solid modelling, Autocad, Work NC 3D CAD-CAM. Rinco Ultrasonic plastics welding horn tuning equipment and power testing facility. (Tuning of horns, sonotrodes and manufacture of Jigs and fixtures for Rinco, Branson, Mecasonic, Telsonic, Herrman and all other manufacturers equipment).